Sunday March 8th 1891 It snowed more that a foot last night and did look so wintry this morning. Will went to town and found Fanny was sick. he went back after both dinner and supper and there was no change in her. I read all my spare time. It was a quiet day here. Monday March 9th 1891 Will took me over to Ott this morning in the big sled. When we got there found that Fanny had given birth to a boy baby weighing 10 1/2 lbs at seven oclock in the morning after a sickness of thirty hours and the baby was dead. Mrs Bartholomew was dressing the little thing. We soon came home and I went back again in the afternoon. I saw Hatt awhile as she was at home. I wrote to Mother and Lizzie Duncan. Tuesday March 10th 1891 I was busy at home all the morning. They buried the baby this morning but I did not go over. I was over in the afternoon. Mrs Bremmer came last night and Willie came from What Cheer. I saw Fanny just for a moment. she looks badly. I stopped at Hatties awhile. Will had a letter from his father Duncan telling him to bring the black horse to Delavan. But he is driving him with our black colt and wont sell him now. I am working on another fly net for ourselves. We were out to Woolf for a call. I had a new boarder come today. Wednesaday March 11th 1891 I was busy all forenoon doing sweeping and fixing up Lees room up stairs for Mr Able. Soon after dinner I went out to Fannys. I did not see her. Hattie was out and was up in the room helping the nurse when I came away. I churned and dressed chickens after I got home. 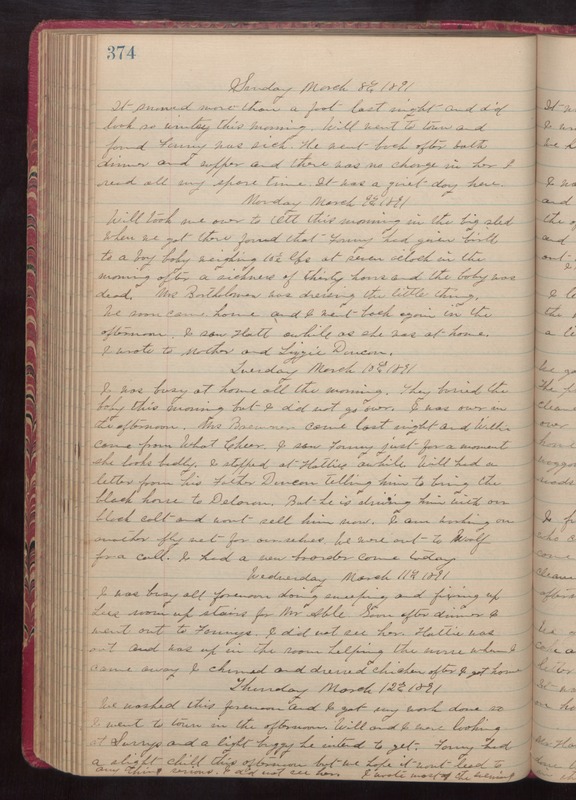 Thursday March 12th 1891 We washed this forenoon and I got my work done so I went to town in the afternoon. Will and I were looking at surrys and a light buggy he intended to get. Fanny had a slight chill this afternoon but we hope it wont lead to any thing serious. I did not see her. I wrote most of the evening.